Dr. Blosser motivates the crowd assembled for the First Annual High Point Food Summit. 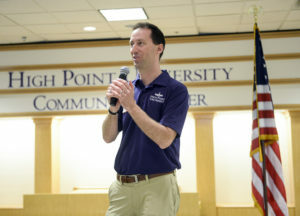 Dr. Blosser joined the High Point University faculty in 2011, and he serves as both the Robert G. Culp Jr. Director of Service Learning and an Associate Professor of Religion and Philosophy. 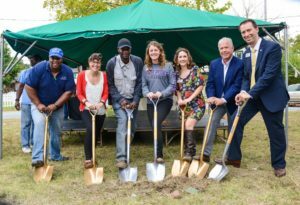 He is the founding director of the Service Learning program, the Bonner Leader Program, the AmeriCorps VISTA Program, and the Civic Responsibility and Social Innovation Degree. He also started and coordinates the University’s MLK Day of Service and Service Showcase, and he helps administer the HPU Community Writing Center. Dr. Blosser lives in, serves, and loves High Point. He serves on the Board of the High Point Community Foundation and chairs their annual Grants Committee. 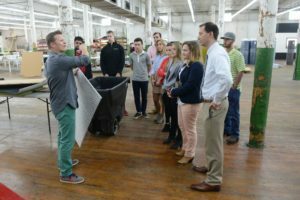 He also serves on the Board of the YMCA, and he is a founding architect of the Greater High Point Food Alliance, which he now serves as their vice-chair. He is currenlty working on the Steering Committee of the High Point Family Justice Center to help develop this essential community resource. Dr. Blosser has served as a Deacon at Emerywood Baptist Church where he and his wife Dr. Allie Blosser (also an HPU professor) attend with their two children. 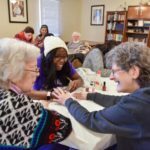 He is engaged in these and more local causes because he believes in the power of anchor institutions, like High Point University, to partner with their communities to achieve a more just and sustainable future for all. In 2014, Dr. Blosser was named the Civic Engagement Professional of the Year by North Carolina Campus Compact. 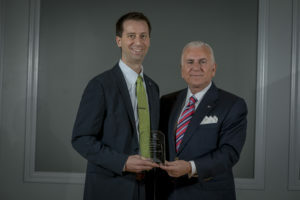 And in 2015, he received the Spirit of Advocacy Award from the High Point United Way for his work in helping to create the Greater High Point Food Alliance. Dr. Blosser is a frequent lecturer, preacher, Sunday School teacher, and consultant for non-profits and churches that are seeking to develop long-term strategic plans to serve their communities. Dr. Blosser’s research includes work in democratic engagement and engaged pedagogies. As an ethicist he specializes in how Christian theology and economic theory can engage each other to produce better communities. He has presented his work at conferences like the American Academy of Religion, the Society of Christian Ethics, the History of Economics Society, the Southwest Social Science Association, and the Comparative and International Education Society. He brings this research into the classroom through courses like Business Ethics, Contemporary Christian Theology, Approaches to Religious Studies, Civic Responsibility and Social Innovation, and the Ethics of Education. His future work will explore Christian and modern economic approaches to ethical issues like poverty, labor unions, and business ethics. He is especially interested in engaged pedagogies that connect his theoretical concerns to the practical needs of the community. As the Robert G. Culp Jr. Director of Service Learning, Dr. Blosser helps faculty develop courses that teach moral thinking and civic responsibility through community engagement. 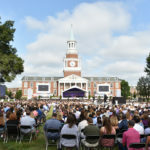 The development of a degree in Civic Responsibility and Social Innovation also helps to further HPU’s commitment to experiential and interdisciplinary education. Through all of these programs, Dr. Blosser works to weave students into the High Point community where they can learn moral thinking and develop moral character by imitating and critically engaging the models set by our many civic leaders. Dr. Blosser is a Phi Beta Kappa graduate of Texas Christian University with a B.S. in Economics and Religion. He graduated from Vanderbilt Divinity School with an M.Div. and is an ordained minister in the Christian Church (Disciples of Christ). He received his Ph.D. in Religious Ethics from the University of Chicago. Dr. Blosser taught at DePaul University for three years before coming to HPU. To see HPU’s Profile of Dr. Blosser, click here.